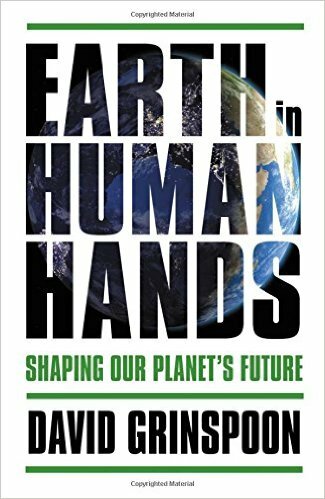 David Grinspoon will be talking about his new book, Earth In Human Hands: Shaping Our Planet's Future. Among the topics to be discussed is the merits and demerits of "activating" the Search for Extra-Terrestrial Intelligence (SETI) by transitioning from passive listening to deliberate sending of messages to targeted star systems. This has become something of a hot topic again with the publication of the end-note in a recent Communications of the ACM by Seth Shostak, wherein SETI's senior astronomer takes an uncharacteristically pessimistic view of the possible consequences of reaching out to our interstellar neighbors. Can science fiction serve as a Gedankenexperiment for possible outcomes in advance of the actuality? Copies of Dr. Grinspoon's book will be available. David Grinspoon is an astrobiologist, award-winning science communicator, and prize-winning author. He is a senior scientist at the Planetary Science Institute and adjunct professor of astrophysical and planetary science at the University of Colorado. His research focuses on climate evolution on Earth-like planets and potential conditions for life elsewhere in the universe. 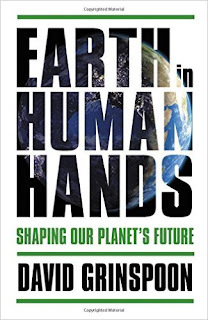 In 2013 he was appointed as the inaugural chair of astrobiology at the U.S. Library of Congress where he studied the human impact on Earth systems and organized a public symposium on the Longevity of Human Civilization. Dr. Grinspoon has been recipient of the Carl Sagan Medal for Public Communication of Planetary Science by the American Astronomical Society and has been honored with the title "Alpha Geek" by "Wired Magazine." Charles F. Wurster, PhD, founding member of the Environmental Defense Fund and a Professor Emeritus of Environmental Sciences at the Marine Sciences Research Center at the State University of New York at Stony Brook, will discuss his book, DDT Wars, describing "the widespread misinformation, disinformation and mythology of the DDT issue." Saturday, April 1 at 1:30 PM at Bethesda Library. On the very pleasant Sunday afternoon of March 29, 1987, at the outdoor amphitheater of the Edmund Burke School in northwest Washington, DC, more than a hundred enthusiastic people attended the inaugural meeting to found the National Capital Area Skeptics. Among them were meeting organizers Jamy Ian Swiss and current board members Chip and Grace Denman. Current board members Nelson Davis Jr, Walter Rowe, and Scott Snell were also in attendance. Chip, Jamy, Stan Bigman (who became the first NCAS president), and Philip J. Klass, the noted aerospace journalist, skeptical UFO investigator, and executive committee member of CSICOP (now called CSI, the Committee for Skeptical Inquiry) spoke to the audience about the purpose and aims of the fledgling organization, and the way forward. Nothing torn this month. Just a quick look back over 30 years. Recall (or ask someone old enough to recall) how difficult information dissemination was back then. Books, magazines, newspapers, radio, and television were everywhere, but the opportunities for skeptics to use them to share information and a skeptical philosophy with the public were few and far between. Any layperson wanting to find reliable information about various subjects (paranormal or not, in some cases) had to work hard, and probably be lucky too. The turning point towards improving the situation for skepticism had occurred a decade earlier, when the Committee for the Scientific Investigation of Claims of the Paranormal (CSICOP) was founded, but progress was still generally slow in 1987. A decade later came the next turning point: the explosive growth of the Internet into everyday life, and the advent of online search engines. At last, skeptics could provide perspectives and findings to the public, unfiltered by editors, publishers, or producers motivated by other agendas. Substantial progress has been made over 30 years, and can probably be maintained, in promoting critical thinking and scientific understanding, and providing information resources regarding extraordinary claims. Possible areas of improvement might leverage the findings of cognitive sciences. How best to present skeptical perspectives and findings in ways that audiences are more likely to learn, remember, and perhaps innovate? Are there ways to reach more people, including those who may not find the usual skeptical topics to be of interest? Meanwhile, the role of local skeptics groups is clearly changing. Groups based on shared values and interests are forming online, making their members' location almost irrelevant. As online technology improves, this trend is likely to accelerate, and will probably offer excellent opportunities for previously unavailable eminent speakers to be virtually (and inexpensively, without travel or lodging costs) brought into communities, both online and in traditional meeting spaces. Local skeptics groups could host and promote events offering two-way communication with remote speakers. The technology isn't quite good enough (quality- and price-wise) yet to be equivalent to in-person interaction, but it may be soon. Looking ahead, the business model for higher education can (or probably should) be changing soon, given the technological communication capabilities at hand or almost within grasp. NCAS and other skeptical groups will probably be able to fulfill their missions using those tools. Once the details get worked out and people get accustomed to using them, these will be very exciting times for education in general and skeptical outreach in particular. Be sure to check out Sharon Hill's skeptically-themed news site, Doubtful News (http://DoubtfulNews.com/), as well as the blog (http://SharonAHill.com/) for her book reviews and other writings. Are you an NCAS member who wants to take a leadership role in the skeptics movement? The NCAS annual board of directors election is fast approaching. Send an email to ncas@ncas.org by March 31 for more information. NCAS Drinking Skeptically is on indefinite hiatus at our Maryland and Virginia locations.